DIVE THE BIG 5’S one-day (at least 4-hours) Great White Shark “breaching,” cage diving and viewing in False Bay off Seal Island. 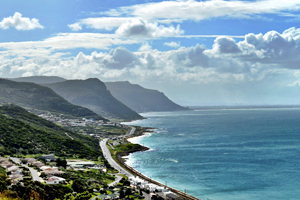 Including: All return transfers from a central location in down-town Cape Town; at least 4-hours at sea watching “breaching,” surface viewing, or cage diving, with the Great White Sharks, Sharks and weather permitting; full equipment hire. At a time to be advised the previous evening, you will be contacted by Dive The Big 5, at your back-packer / B&B / Hotel in Cape Town, to advise you of the pick-up time from your accommodation establishment in down-town Cape Town for the 45-km / 1-hour road transfer to the dive shop in Simon’s Town. After meeting the dive boat crew and your fellow dive buddies, and after signing the necessary indemnity form, you will all be transferred to the Simon’s Town Pier where you will be welcomed aboard the dive the boat. You will receive a quick safety briefing before departing the quay for Seal Island, which is a 25 – 35 minute boat ride from Simons Town. You will spend about 4 hours at sea observing the natural predation of the Great White’s, which makes Seal Island so unique. The Great Whites of Seal Island are now world famous for their highly athletic breaches that they make in pursuit of Cape Fur seals which they hunt in the area. You will observe natural predatory behaviour for as long as possible. However, it is usually the first hour and a half that is the most intense. After this period, a short decoy, cut out in the form of a seal, is towed in order to try to get the sharks to breach. It is a unique way to elicit predatory behaviour and has been very useful to help us learn different strategies adopted by different sharks. After the decoy tow, an inspection lap is done around Seal Island, which gives you a great opportunity to get close to the 64 000 strong Cape Fur Seal colony that has made Seal Island its home. The skipper will then choose the best place to anchor up, based on weather conditions, and try to attract sharks to the dive boat. Once a shark approaches the dive boat, a small piece of bait is put in the water to keep the sharks interested around the boat for identification purposes. At no point are the sharks purposefully fed, or handled. We do not use shark livers or any other attractants that may have a negative impact on the environment, and every effort are made to avoid the sharks coming into contact with the dive boat. If the weather conditions are favourable, i.e. good visibility and workable seas, the cage is lowered into the water for cage diving. Safety precautions and operational procedures are then explained to the divers wishing to enter the cage. Light snacks consisting of bread rolls with cold meat as well as a vegetarian option, soft drinks, bottled water and a variety of other snacks are available throughout the course of the morning. 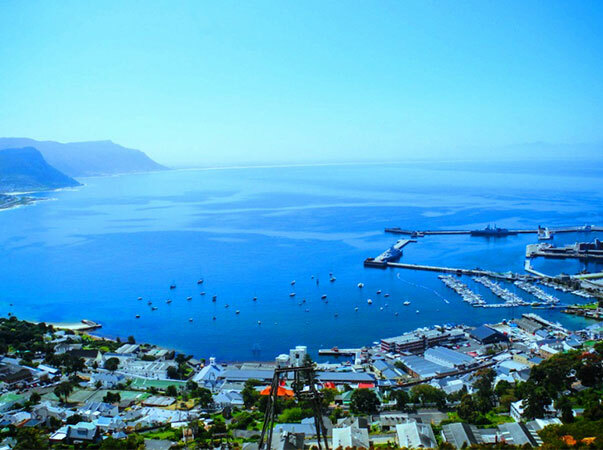 At about 11h30, the boat will return back in Simons Town Harbour, depending on Shark activity and the weather conditions, and you will then be transferred back to your Back-packer / B&B / hotel in Cape Town. per person, diver or surface viewer. In order to do the Great White Shark cage dive you do not have to be a certified diver. Non-divers can get into the cage and experience the thrill of meeting a Great White Shark face-to-face. If you are dubious about getting into the cage, it’s also a thrill viewing the “action” from the “safely” of viewing deck. No Surface Interval Time (SIT) is required after a Great White cage dive. You can board a plane immediately after a Great White cage dive! 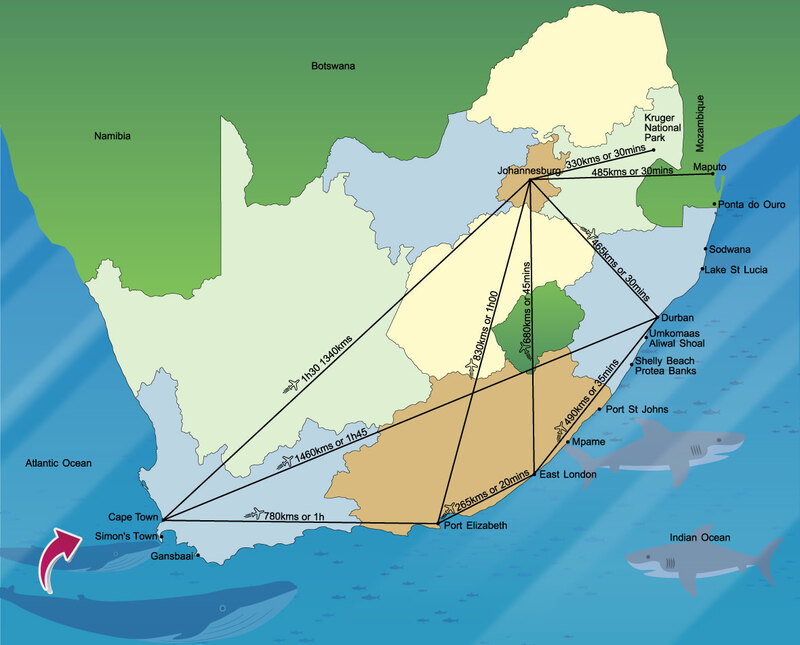 Please note that from mid-September to mid-January is closed season, due to their being no Great White Sharks in False Bay, historically speaking. We are however able to offer 2-tank combination Broadnose Seven-gill Cow Shark / kelp forest / reef / Cape Fur Seal dives throughout the year. In order to do this 2-tank dive you need to be a certified diver and you will have to do a SIT (Surface Interval Time) before flying. If a strong wind picks up whilst we are at sea and a return to shore is required for the safety of the passengers and crew, no refund is given, but we will graciously offer a voucher for a complementary trip. The Skippers decision is final, and is in the passenger and crews interest. Please keep in mind that we are dealing with wild animals, in their natural environment, so sightings cannot be guaranteed. Refunds are therefore not considered in the event of no Great White Shark activity, however a second tour will be offered free of charge. Please note: Planes and trains depart on time. So do dive boats! If you are prone to getting sea sick, please ensure that you take your anti sea sick tablets at least 2-hours before you are due to board the dive boat, and again, when you get aboard. 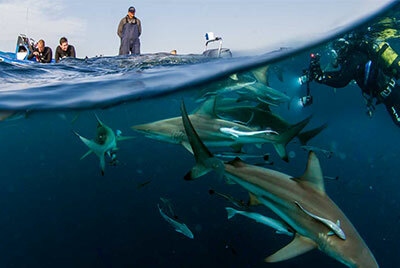 Dive The Big 5 started Great White Shark Shark cage diving since our inception in 1996. Even then, Great White Shark cage diving was a contentious issue! What with cages, chum, bait, shark / human interaction, the sound of a boats motor as an indication to the sharks that they were in for a “free meal”, etc, etc. I could go on for ever. In the 22-years that we have been offering Great White Shark cage diving we have never had a client get off the dive boat who has not become an ambassador for the Great White Shark! They immediately start spreading the gospel about the amazing creature that they have just been introduced to. The sceptics have all become total converts! It’s all about educating the masses, but time, ignorance and human explosion is the key. Elephant poaching is exactly the same. Join Dive The Big 5 on a Wildlife Safari, and let us take you on a “trunk in hand” elephant encounter. Elephants, like Great White Sharks need as many “Elephant / Great White Ambassadors as they can get!